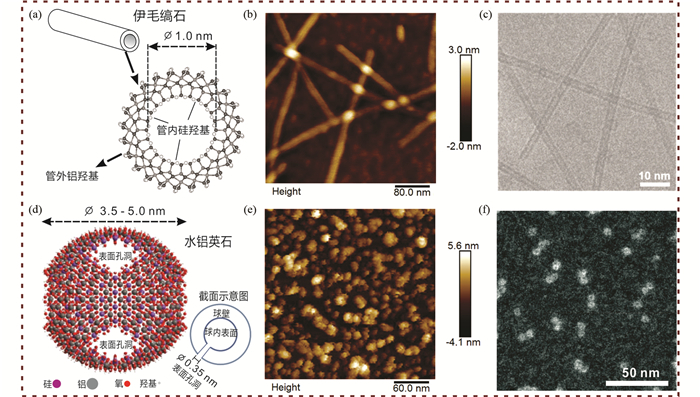 Abstract: In this paper, the characteristics of the structures and properties of three typical aluminosilicate nanominerals, namely, halloysite, imogolite and allophane, are briefly discussed. The roles and related mechanisms of these minerals in the processes of element migration and accumulation in their typical occurring environments are reviewed. Such processes include the roles of halloysite for the storage of rare earth elements (REE) in leaching weathering-crust REE deposits and the roles of imogolite and allophane for the migration of heavy metal ions, radioactive elements, anions and organic carbon in volcanical soils. How the various local structures and surface properties of the aluminosilicate nanominerals determine their performance (e.g., in adsorption) as the host minerals and affect the related geochemical processes are discussed. Particular concern is put on the unique reactivity related to certain microstructures of the above-mentioned nanominerals, such as the inner surface of tubular structure of halloysite. The potentials, applicability and prospects of these unique nonmentallic nanominerals for industrial applications are also discussed. Arai Y, Sparks DL and Davis JA. 2005. Arsenate adsorption mechanisms at the allophane-water interface. Environmental Science & Technology, 39(8): 2537-2544. Basile-Doelsch I, Amundson R, Stone WEE, Masiello CA, Bottero JY, Colin F, Masin F, Borschneck D and Meunier JD. 2005. Mineralogical control of organic carbon dynamics in a volcanic ash soil on La Reunion. European Journal of Soil Science, 56(6): 689-703. Chen QR, Lei J and Cui GJ. 1980. 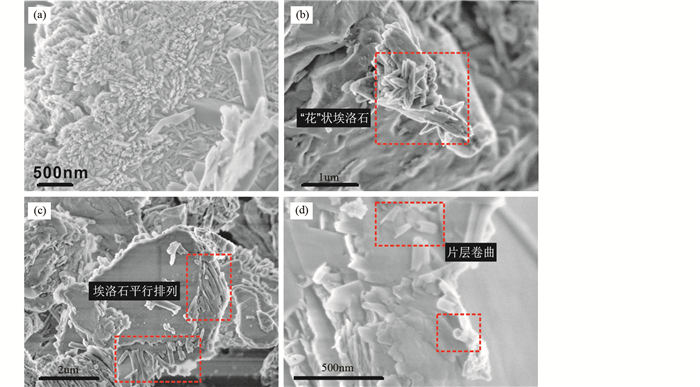 The study on characteristics and extraction technology of ion-adsorbed rare earth deposits. Multipurpose Utilization of Mineral Resources, (1): 48-55. Chi RA and Tian J. 2007. Review of weathered crust rare earth ore. Journal of the Chinese Rare Earth Society, 25(6): 641-650. Chi RA, Tian J, Luo XP, Xu ZG and He ZY. 2012. The basic research on the weathered crust elution-deposited rare earth ores. Nonferrous Metals Science and Engineering, 3(4): 1-13. Colman SM. 1982. Chemical weathering of basalts and andesites:Evidence from weathering rinds. U. S. Geological Survey Professional Paper, 1246. Dohrmann R, Meyer I, Kaufhold S, Jahn R, Kleber M and Kasbohm J. 2002. Rietveld based-quantification of allophane. Mainzer Naturwissenschaftliches Archiv, 40: 28-30. Edmeades DC, Metherell AK, Waller JE, Roberts AHC and Morton JD. 2006. Defining the relationships between pasture production and soil P and the development of a dynamic P model for New Zealand pastures:A review of recent developments. New Zealand Journal of Agricultural Research, 49(2): 207-222. Fan CZ, Zhang Y, Chen ZH, Zhu Y and Fan XT. 2015. The study of clay minerals from weathered crust rare earth ores in southern Jiangxi Province. Acta Petrologica et Mineralogica, 34(6): 803-810. Fernandez-Martinez A and Michot LJ. 2016. Physicochemical properties of imogolite. In:Yuan P, Thill A and Bergaya F (eds.). Developments in Clay Science:Nanosized Tubular Clay Minerals. Amsterdam:Elsevier, 7: 202-222. Ghoneim AM, Matsue N and Henmi T. 2001. Zinc adsorption on nano-ball allophanes with different Si/Al ratios. Clay Science, 11(4): 337-348. González-Pérez JA, Arbelo CD, González-Vila FJ, Rodríguez AR, Almendros G, Armas CM and Polvillo O. 2007. Molecular features of organic matter in diagnostic horizons from andosols as seen by analytical pyrolysis. Journal of Analytical & Applied Pyrolysis, 80(2): 369-382. Gustafsson JP, Karltun E and Bhattacharya P. 1998. Allophane and imogolite in Swedish soils.Research Report Trita-Ami 3046. Stockholm, Sweden: Division of Land and Water Research, Royal Institute of Technology (KTH). Liu JM. 2002. Unconventional mineral resources related to natural nm-sized minerals. Mineral Deposits, 21(Suppl.1): 32-35. Liu R, Wang RC, Lu XC and Li J. 2016. Nano-sized rare earth minerals from granite-related weathering-type REE deposits in southern Jiangxi. Acta Petrologica et Mineralogica, 35(4): 617-626. Lu AH. 2000. Development of properties of mineralogy from resource to environmental. Geological Journal of China Universities, 6(2): 245-251. Martin JP, Zunino H, Peirano P, Caiozzi M and Haider K. 1982. Decomposition of 14C-labeled lignins, model humic acid polymers, and fungal melanins in allophanic soils. Soil Biology & Biochemistry, 14(3): 289-293. Ookawa M, Inoue Y, Watanabe M, Suzuki M and Yamaguchi T. 2006. Synthesis and characterization of Fe containing imogolite. Clay Science, 12(S2): 280-284. Tsuchida H, Ooi S, Nakaishi K and Adachi Y. 2005. Effects of pH and ionic strength on electrokinetic properties of imogolite. Colloids and Surfaces A:Physicochemical and Engineering Aspects, 265(1-3): 131-134. Yang YX, Zhang NX, Su ZB, Chen ZG, Pan JQ, Cai XC, Guo JG, Liu GK and Kan XM. 1994. Clay Minerals of China. Beijing: Geological Publishing House. Yang ZM. 1987. A study on clay minerals from the REE-rich weathered crust developed on the Longnan granite in Jiangxi. Chinese Journal of Geology, (1): 70-80. Yuan P, Thill A and Annabi-Bergaya F. 2016. Nanosized Tubular Clay Minerals. Amsterdam: Elsevier. Yuan P. 2018. Unique structure and surface-interface reactivity of nanostructured minerals. Earth Science, 43(5): 1384-1407. Zhang L, Wu KX, Chen LK, Zhu P and Ouyang H. 2015. Overview of metallogenic features of ion-adsorption type REE deposits in southern Jiangxi Province. 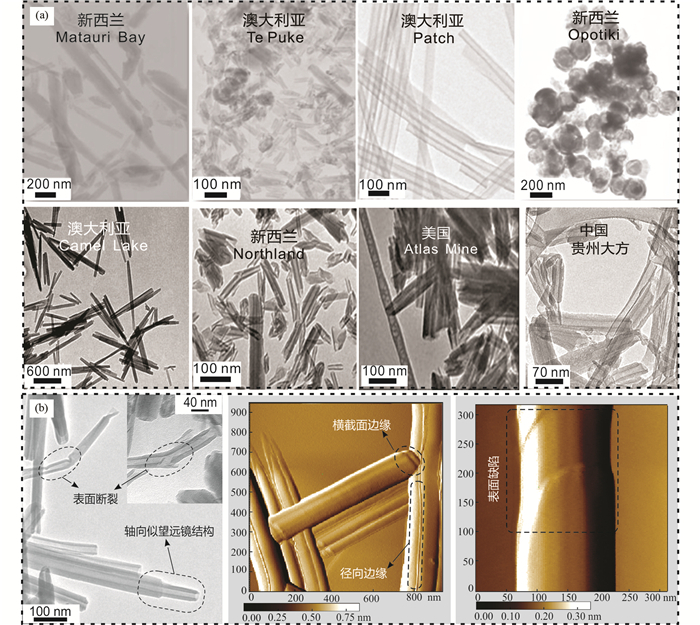 Journal of the Chinese Society of Rare Earths, 33(1): 10-17. Zhang TL and Wang ZL. 1989. 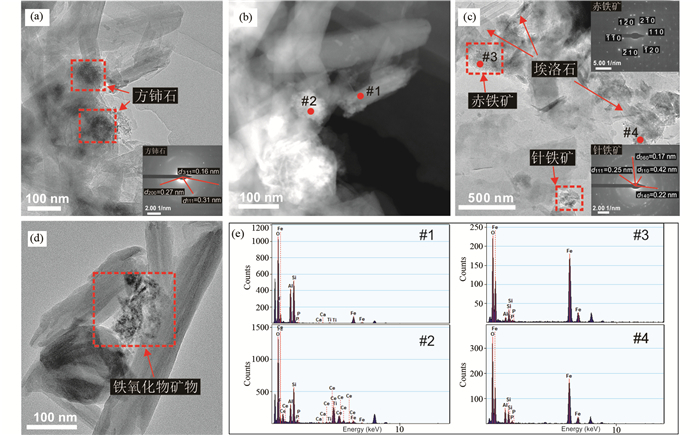 The first discovery of imogolite in China and its analytical electron microscopy (AEM) investigation. Acta Petrologica et Mineralogica, 8(4): 347-352, 383. Zhang TL and Wang ZL. 1992. A study of kaolin minerals from the Guoshan kaolin deposit, Fujian Province. Acta Petrologica et Mineralogica, 11(2): 146-156. Zhang ZH. 1990. A study on weathering crust ion adsorption type REE deposits, South China. Contributions to Geology and Mineral Resources Research, (1): 57-71. Zhao HM and Yuan BY. 1990. Discovery of imogolite in Luochuan loess profile. Chinese Science Bulletin, 35(10): 840-844. Zhao QG. 1987. Overview of the 9th International Conference on Soil Classification. Soils, (6): 330-334. Zhou JM, Yuan P, Yu L, Liu XY, Zhang BF, Fan WX and Liu D. 2018. Fine-grained particle characteristics of tuff weathering crust from Bachi rare earth element (REE) ores in northern Guangdong Province. Acta Mineralogica Sinica, 38(4): 70-77. 陈启仁, 雷捷, 崔国际. 1980. 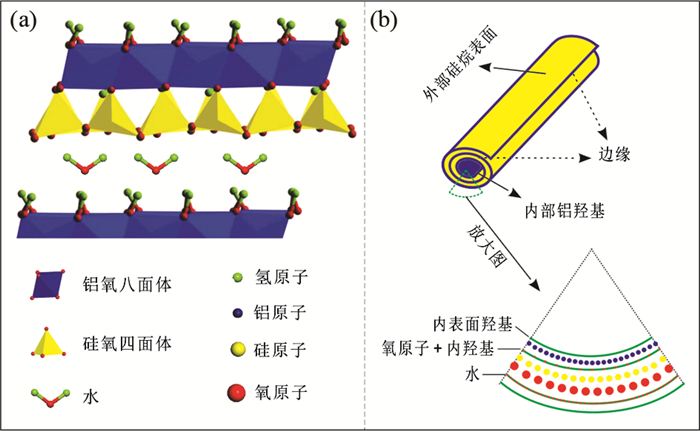 离子吸附型稀土矿特征及其提取工艺的研究. 矿产综合利用, (1): 48-55. 池汝安, 田君, 罗仙平, 徐志高, 何正艳. 2012. 风化壳淋积型稀土矿的基础研究. 有色金属科学与工程, 3(4): 1-13. 刘建明. 2002. 与天然纳米-亚微米矿物有关的非传统(非常规)矿产资源. 矿床地质, 21(增1): 32-35. 许冀泉. 1982. 土壤矿物. 土壤, (2): 76-80. 杨雅秀, 张乃娴, 苏昭冰, 陈正国, 潘建强, 蔡秀成, 郭九皋, 刘高魁, 阚学敏. 1994. 中国粘土矿物. 北京: 地质出版社. 杨主明. 1987. 江西龙南花岗岩稀土风化壳中粘土矿物的研究. 地质科学, (1): 70-80. 袁鹏. 2018. 纳米结构矿物的特殊结构和表-界面反应性. 地球科学, 43(5): 1384-1407. 张恋, 吴开兴, 陈陵康, 朱平, 欧阳怀. 2015. 赣南离子吸附型稀土矿床成矿特征概述. 中国稀土学报, 33(1): 10-17. 张天乐, 王宗良. 1989. 伊毛缟石在我国的首次发现及其分析电子显微术研究. 岩石矿物学杂志, 8(4): 347-352, 383. 张天乐, 王宗良. 1992. 福建郭山高岭土矿床中高岭矿物的研究. 岩石矿物学杂志, 11(2): 146-156. 张祖海. 1990. 华南风化壳离子吸附型稀土矿床. 地质找矿论丛, (1): 57-71. 赵惠敏, 袁宝印. 1989. 洛川黄土剖面中伊毛缟石的发现. 科学通报, (18): 1402-1404. 赵其国. 1987. 第九次国际土壤分类工作会议概况. 土壤, (6): 330-334. 周军明, 袁鹏, 余亮, 刘小永, 张佰发, 樊文枭, 刘冬. 2018. 八尺风化淋积型稀土矿凝灰岩风化壳中的细粒矿物特征. 矿物学报, 38(4): 70-77.